My 2-bedroom features a king bed in the master bedroom with a full bath, the guest bedroom has a queen bed with a full bath. I also have a 1-bedroom, 1-bath condo for rent in the same building. 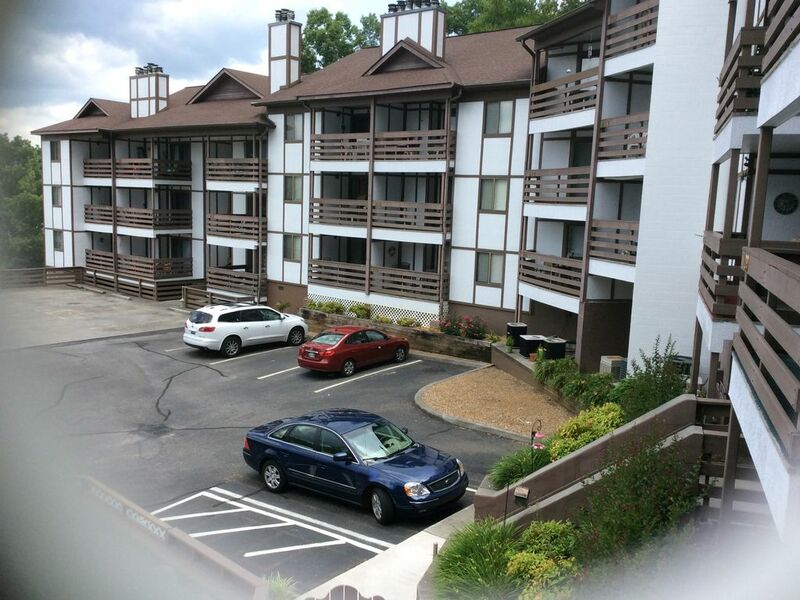 You are walking distance to downtown Gatlinburg, but have the privacy of being in the mountains. Only a few minutes walk to the convention center. Go hiking, shopping, or sightseeing then come home and relax by the pool or sit on your private balcony which has a fantastic view of the mountains. I am sure you will enjoy visiting Windy Oaks as much I enjoy living here.. Please leave your comments in my guest book when you get home so others will know how much you enjoyed your stay here. Hello, I am Thelma, Mother of 4 wonderful children and Nana of 7 awesome grandchildren. Most of all, I love spending time with them. I grew up in Tazewell, TN which is only 2 hours from Gatlinburg. I was a teacher for 36 years until June, 2014 when I officially retired. I currently live at Windy Oaks condos and I want to spend more time taking care of my condos and meeting all the new people who spend their vacation in one of my condos. Most of my life I have spent time coming to Gatlinburg to the parades, craft shows, Dollywood, and traveling through the beautiful Smoky Mountains. My children and I were spending spring break here and I saw a condo for sale at Windy Oaks and fell in love with the complex when I came to look at it. I wanted a place we could come to on weekends and vacations. In the fall of 2000, I came here to live. I am proud to own condos here and live here full time. I fell in love the first time I walked on the balcony and looked at the view. It is close to downtown Gatlinburg but away from the hustle and bustle. A few of the owners live here and others only use their condo for a second home. Some of us have condos that we rent by owner. Windy Oaks is more of a home than a rental property. It is a quiet place to come home to after a day of shopping, going to Dollywood or hiking in the mountains. You can take a dip in the pool or spend some quiet time on the balcony with a good book and enjoying the view. Our building is multi-level. There are a few steps to the condo. Very comfortable and a great location! The condo was homey with all items we needed. It was clean and well kept. Thelma was available to us by phone for questions. Thank you for your stay. So sorry I did not get to meet you. Maybe next trip. Thank you for your stay at my condo. It was very nice to meet and I look forward to your next visit. The location in Gatlinburg was both quiet and convenient. It did require a car since it was a little too far (and steep), but just a few blocks away was plenty of parking and all the restaurants and evening attractions. Very easy access to get into national park. The condo was clean and comfortable and a great bargain for our Christmas vacation. Thank you very much for your stay in my condo. I hope to see you again. Thelma is always accommodating and makes things possible at whatever time you’re arriving 😊� There is a plethora of There is a plethora of information on Gatlinburg and Pigeon Forge available so it’s easy to plan your day’s activities. The condo is clean and decorated with the Smokey Mountains theme yet feels homey. There is more than adequate kitchen supplies and extra bed and bathroom linens available to use. We love the mountains, especially the Smokey’s, and will be back again! Thank you so much for another stay. I always want you to feel at home. We are close to town but away from the hustle and bustle. Great proximity to the Smoky Mountains National Park. Quiet location. Owner helpful & responsive. Although the condo we stayed in #112 was dated, especially the TVs (picture tube, not LCD OR LED), it is a nice place. Beds were comfortable, however pillows didn’t provide support I needed so I would wake up with a sore neck. Kitchen is very well equipped with appliances and utensils. The place does not get much natural light but if you are like us, you aren’t there during the day so it was not a problem. Condo is about 5 blocks to walk or 2-3 blocks to the shuttle to town but it’s a steep hill to walk up or down. I was up for the challenge but I definitely would not risk it if it’s wet or icy. Thelma lives on site so she is able to respond to any issues quickly. Make sure to bring your own soaps, hair products. Overall we had a wonderful stay and would stay again.